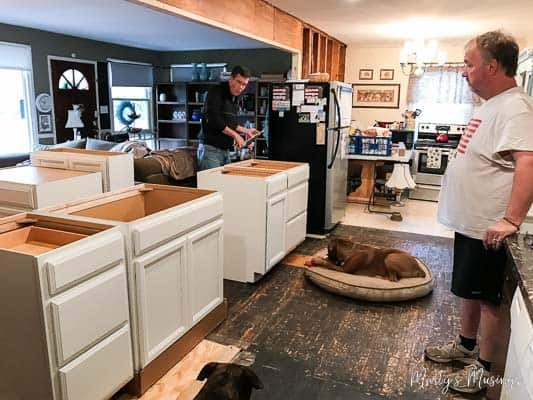 These home remodeling tips for you and your dog will help you plan your next big project and keep both you and your dog safe and happy during construction! 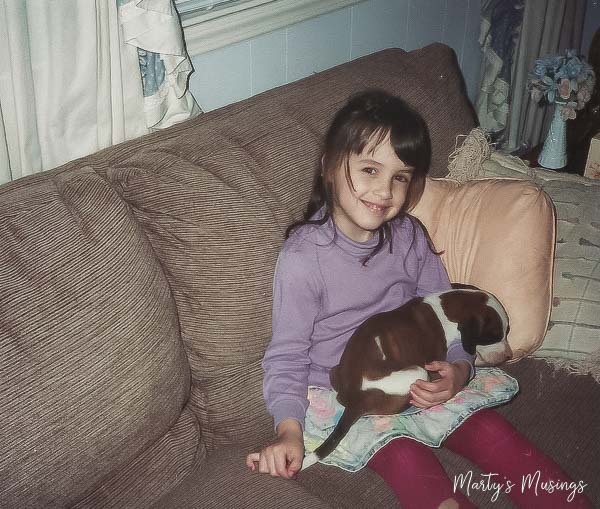 When my husband and I got married 30 years ago I had never owned a dog before, unless you count the chihuahua we had when I was a little kid. Frisky was his name and I used to toss him up in the air on my parents bed. I never understood why he preferred sitting on my MawMaw’s lap and didn’t want anything to do with me. Tim and I started our animal relationship with cats but he was definitely a dog person. 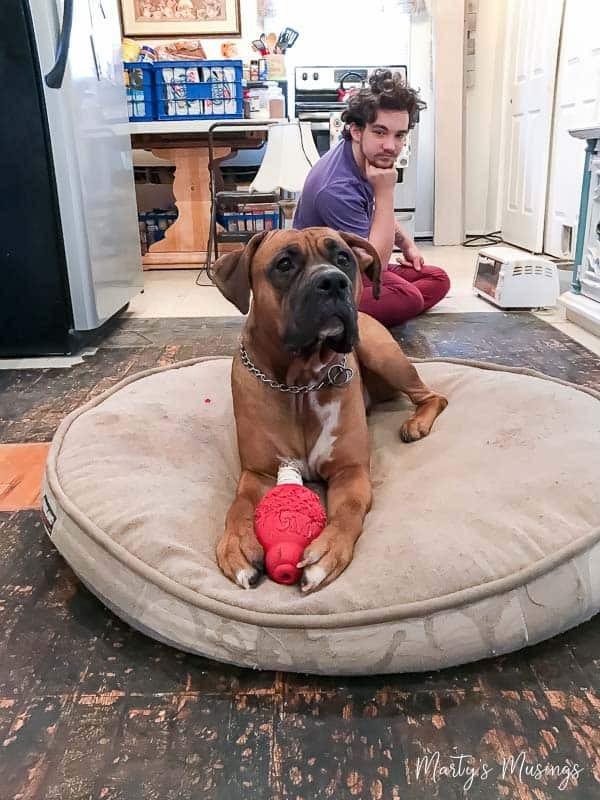 Somehow he coerced me into buying the very first Walden dog we named Andy. Although he was an outdoor pet, you shouldn’t feel too sorry for him because he had his own door in the workshop and a couch to curl up on. Of course Andy needed a companion and soon Amy joined the Walden bunch. My husband played NOT FAIR by bringing a tiny bundle of black fur home and showing her to the kids FIRST. 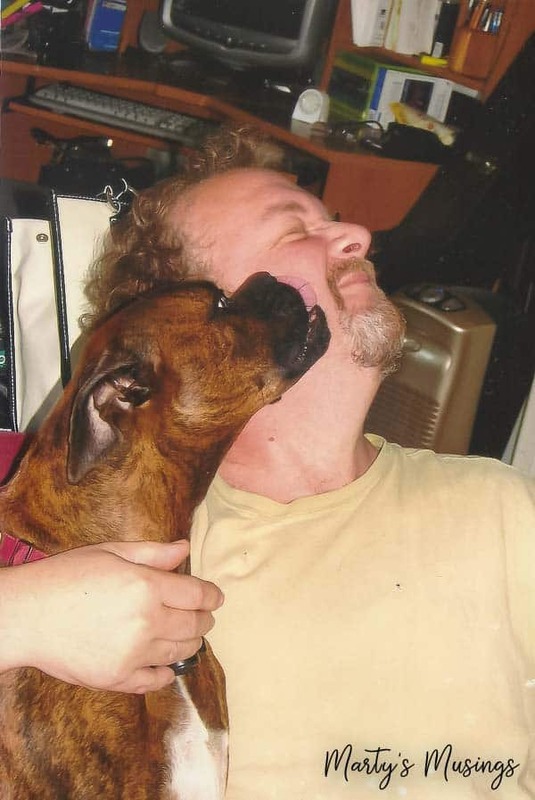 Annabelle was our pure-bred boxer and my husband’s second love. I probably should have been jealous but you know men and their dogs. Holly, short for Hollywood because we were American Idol fans at the time, was found on the side of a highway by our neighbor. She was then snuck in the front door ONE MORE TIME by my husband so the kids could become attached before mama saw her. 2015 was a rough year for our family and it included health scares, the loss of a close family member and many emotional ups and downs. In the midst of that turmoil we decided to adopt a puppy since Holly was our only dog at that point. This time the decision was all MINE. The little bundle of sweetness we named Mr. Carson (after Downton Abbey) was born about the same time as my grandson. 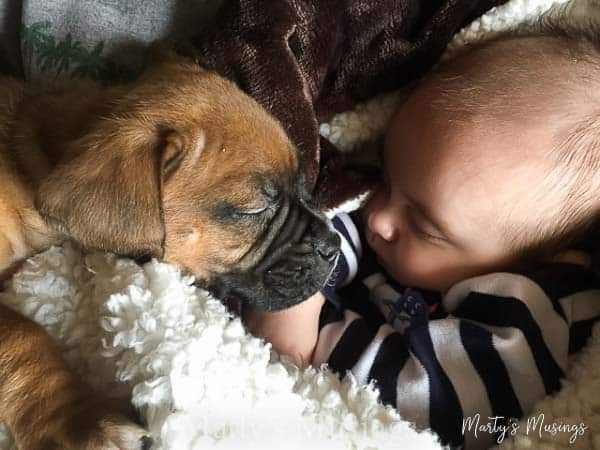 Both boys brought tons of joy and energy to our lives! Since we are almost empty nesters I’ve spent more time with Carson than any of our other dogs. He’s the 75-lb lap dog who rules our home. As most of you know we’ve recently undertaken a huge kitchen remodel in our home by tearing down a wall between our kitchen and living room. Plus, we jumped into the project two weeks earlier than expected, right before Christmas. Can you say we’re a wee bit crazy and chaotic? Sometimes we think the only family members that can become stressed by extra activities are human but in reality our pets are affected as well. 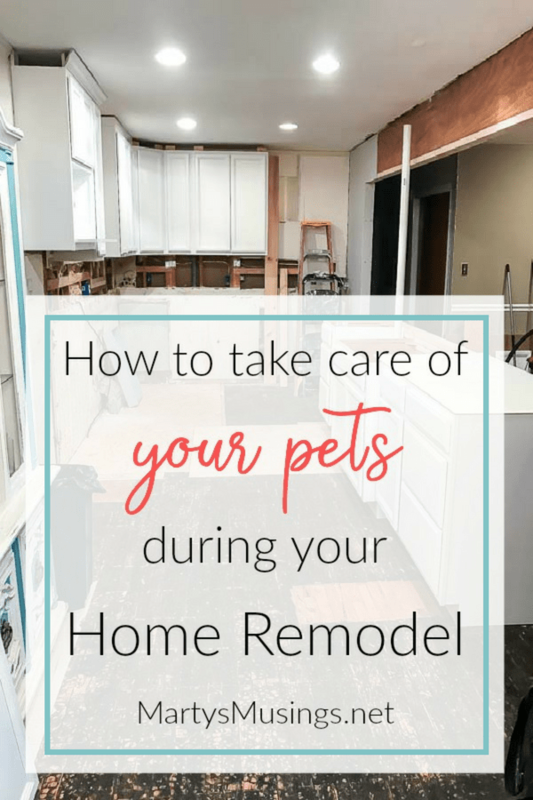 I want to share these 4 home remodeling tips for you and your dog in the hopes it will help you make a plan for taking care of those four legged critters you love! 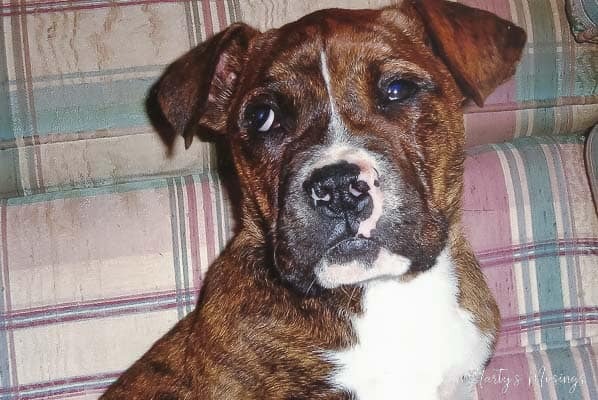 Part pit bull, part boxer, our dogs love attention but if they don’t know you they’ll bite your head off without thinking twice! Since my husband and I were both home most days we not only had to navigate construction workers but also two barking dogs. 1. Let the workers see your dogs are friendly and approachable. 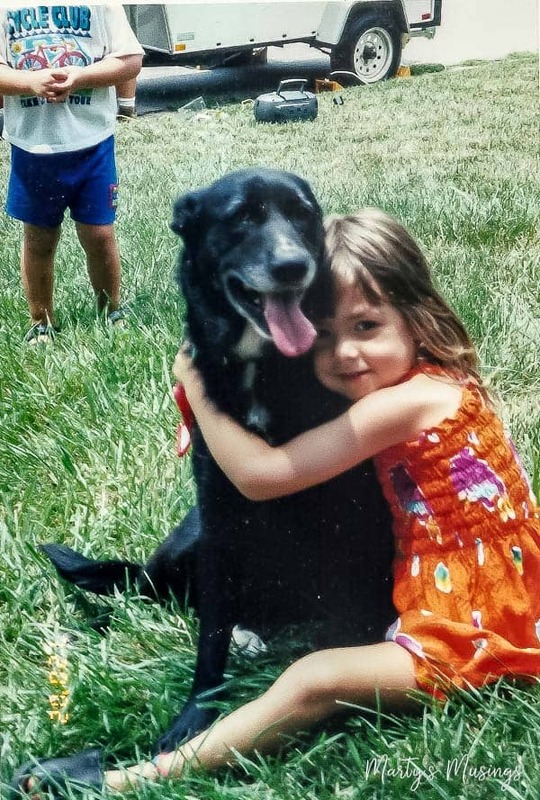 Some of our workers loved our dogs and some not so much. We always asked before we opened the front door and then held their collars so they could acclimate to the men coming in and out. Except for the day when the wall was taken down, there usually weren’t more than three or four people here at a time. We had so much electrical work done that one of the workers practically became part of the family and looked forward to seeing Carson every day. 2. Separate your dogs from the construction when it becomes too hectic and noisy. If the dogs became a nuisance or got in the way we locked them in the back of the house where they could still observe the action but weren’t underfoot. 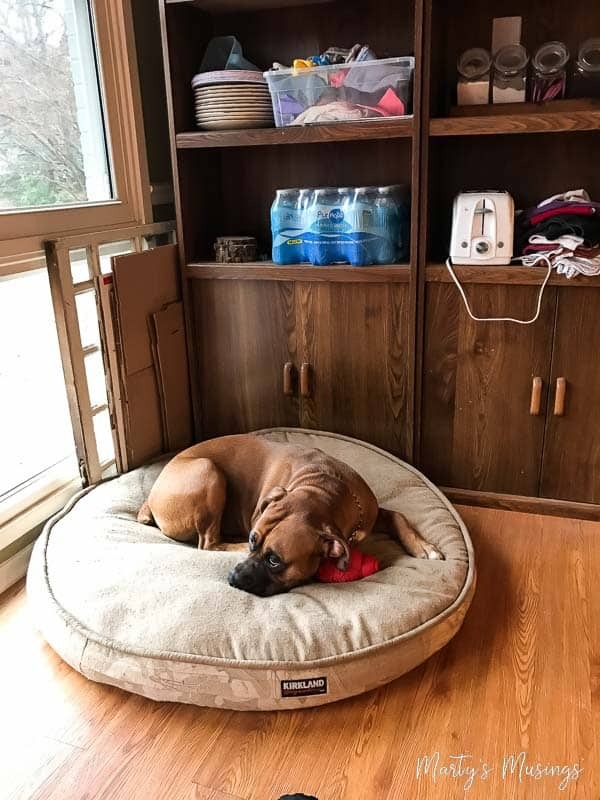 We don’t have dog crates anymore but if your dog feels safe in that environment it would be a great way to make them comfortable. 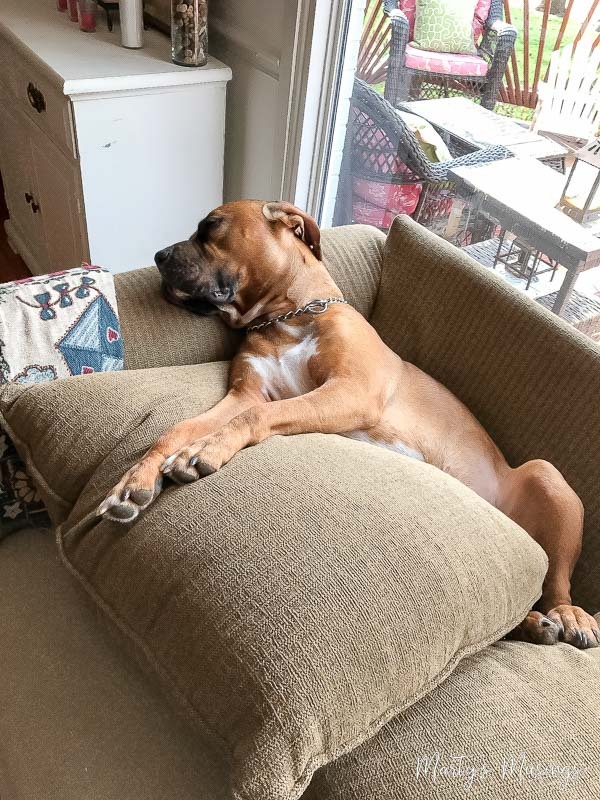 Some dogs are extremely sensitive to noise so finding a secluded place far from the action is crucial or keeping them outside could be a possibility. 3. Make sure to include time for exercise and fun, for both you AND your dog! Taking the time to play with your dog will help you AND your puppy! Carson will come to me at the computer and shove my arm away from the keyboard to play with him. He knows that having fun relieves stress and brings laughter to days filled with decisions and messes and dust. LOTS of dust. For heaven’s sake, don’t forget to feed your dogs! When your schedules are off and one day there’s a wall and the next there’s not, it’s easy to forget lots of stuff! I’d go reaching for a light switch and there was no wall. It was totally weird! Even though we packed up most of the living room and a good majority of the kitchen, there was still STUFF everywhere. 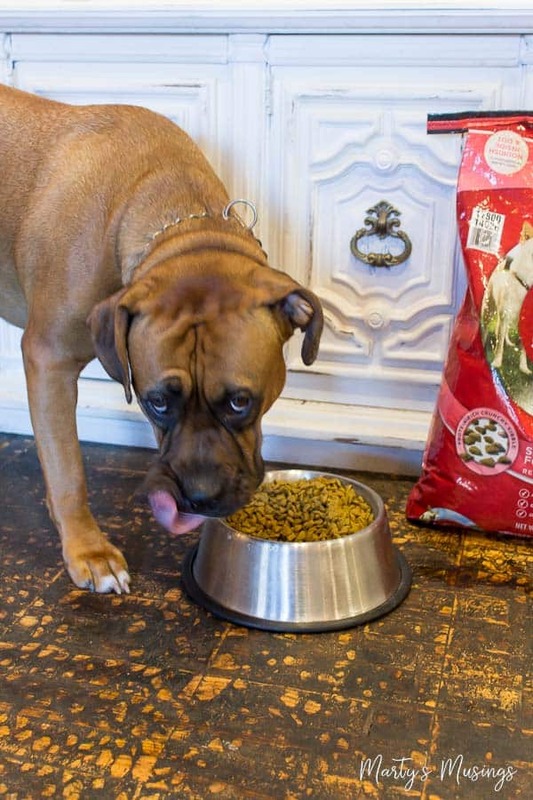 Make sure you can find your pet food and the dog can find his bowl! This may sound simplistic but I promise you I speak from experience. Also take care of your pet and feed them well. 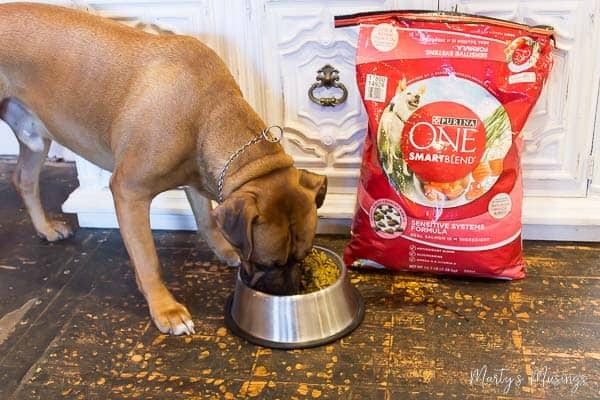 I chose Purina One® Smartblend® Sensitive Systems Formula Adult Premium Dog food because Carson has some skin allergies. Sensitive Systems Formula has real salmon as the first ingredient blended with other high-quality ingredients which is so important for sensitive skin and stomach. 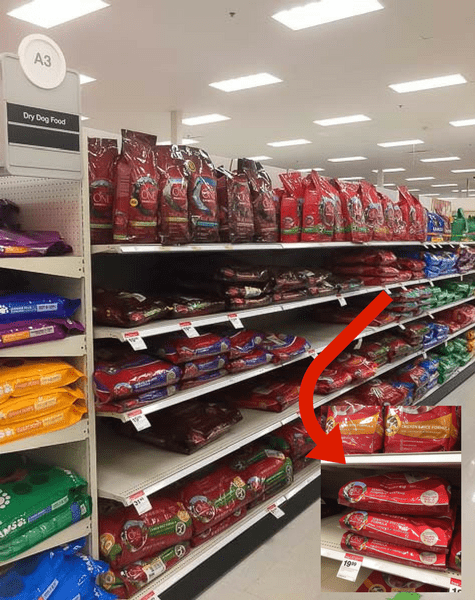 No matter which food you select there are tons of Purina dry dog food choices available at Target in the pet aisle. 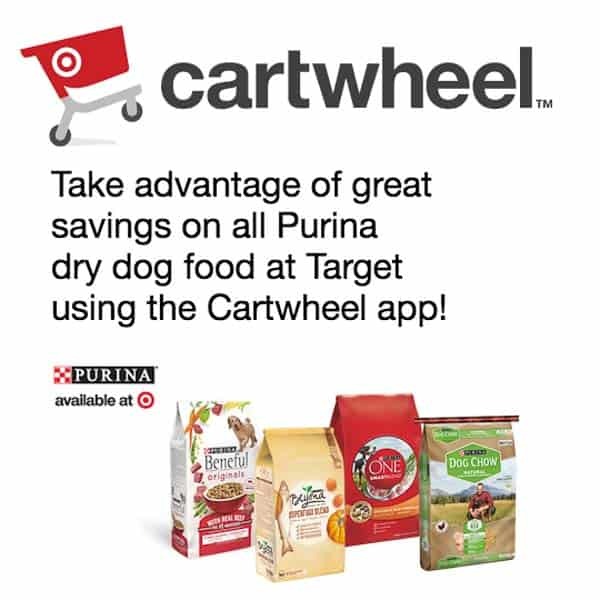 You guys know I love a bargain so click the image below for 20% off of great Purina dry dog foods at Target during the month of March! 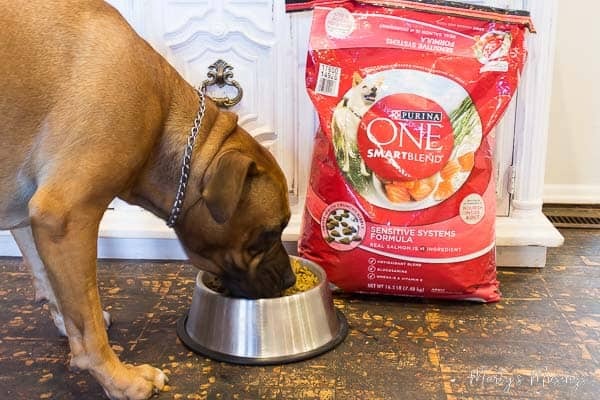 You can also find Purina on Facebook, Twitter , YouTube , Pinterest and Instagram. No, we’re still not done with the kitchen as evidenced by the floors in these pictures, but we’re getting closer! Still laughing Marty ! I believe animals are here to entertain us and teach us unconditional love. These pictures are great. Hi, Diana. Our pets have definitely tested our love at times. Oh, the stories I could tell! As always, thanks for being such a loyal reader! Have a great day! Hi, Allison, We still have the floors to do in our kitchen and family room so I’m impatiently waiting for that last piece of the remodel to fall into place! We love our dogs but they require time and effort just like children do and sometimes owners don’t think about that. I enjoyed working with you on this campaign! Cats too can get stressed with different people coming in and out. I would sometimes put mine in her cat carrier (really a small dog carrier) but put where she could still see the action or sometimes she wanted to escape into the mudroom and I would let her. Or keep her in the bedroom for a while. She likes the cat carrier and feels secure in there-if your cat doesn’t like that then I would not put them in there. Hi, Abrianna, We also have two cats and they would just hide when we had workers here. In general, my daughter’s bedroom away from the action was the safest place for them. If your pet feels safe in a carrier that is a great option as well. I had to move my office into my craft room during this time (and have just kept it there) because I needed to escape the chaos as well!